This utterly confusing, yet marvelous action-comedy is one that I can’t quite explain, so I’m not even gonna try. 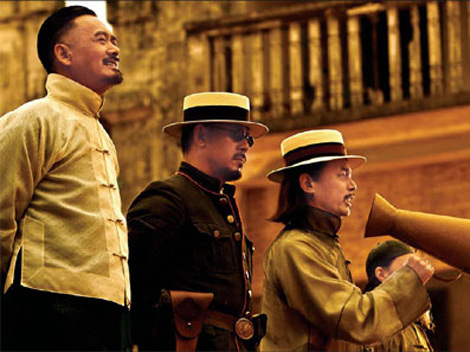 But in brief, much of the confusion, and some of the comedy stems from the mistaken identities, and confusion over who’s on which side and what’s motivating them in this film where everyone is a “Bad-Guy.” The film is set in the 1920s, in a Chinese landscape that looks like something out of an old Clint Eastwood western. Wen Jiang plays an outlaw named Pocky, who hi-jacks a train (Drawn by horses, don’t ask why) and then masquerading as the newly arriving Governor. A local mobster (Chow Yun-Fat) is none to pleased to have a new official to answer to, since we understand that prior Governors were just his puppets. So the film is about these two competing forces in what is truly a lawless town. The acting was pretty bad with exception of the lead actor who also co-wrote ad directed the film. It was fun. But also outlandishly complicated and consisted of a scene in which a young man named six, cuts open his stomach to prove he ate only one container of jelly, How this is the highest grossing movie in China is completely beyond me.